I had forgotten why I love Stephen King. But what about the Master of Horror? What’s been going on with his writing? It was daunting and a little scary, but I soon forgot about it as I got on with the work of writing my first book. And things began to progress nicely with “the book”. It started to flow- I could write 10-12 pages in a day and not be tired. I wanted to write more and say more and I had all these ideas in my head. I thought to myself, By Jove, I’m actually pretty good at this writing lark. I think I even got an itsy bit arrogant about it – the public wouldn’t even know what hit them! Well, that notion faded a little as some of the later chapters became harder to write, but I still didn’t lose that edge of confidence. Yes, there was a lot of paranormal fiction out there (thankfully, no vampires here), but I would be better. I was perfectly suited for this genre. After all, I was a morbid little girl fascinated with witches, vampires, and ogres who grew up to be a Goth for almost twenty years. I knew the supernatural. I lived it. The marriage had been the best time, and it had only lasted eighteen months. The womb of his young wife had borne a single dark and malignant child. Or the colorful, local dialects sprinkled with some of the most imaginative curses ever – Christ on a pony, Moses in the bullrushes, and the list goes on. That’s just the tip of the iceberg as they say. The descriptions of Arnette, Texas, Hap’s gas station, the menacing atmosphere as everyone gets sick makes me want to cry out, “I’m not worthy!” And I’m only a few chapters into a very and I mean very long book (try 1,153 pages). How does he do it? Will I ever be 1/10th the size of that sun? 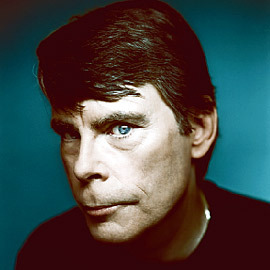 (At the moment you could fit 1,259,712 of me inside Stephen King if the logic follows). But I digress. Stephen King is a writing God. And if I’m every lucky enough to sit down and have a cup of coffee with him, I just pray to the cosmic forces that there’s no talk of vampires . . .